In November of 2017, people from across Beirut came to the National Museum and gave their voices to a number of objects in the collection. The people spoke to and for and about these objects from the past, and, in doing so, they revealed fragments of the present. They did not attempt to disclose a particular historical narrative. Nor did they attempt to create a fiction. They did not lie and they did not try to tell the truth. These bulls have spent close to 2500 years in eternal opposition. They tower above their viewers, daring those below to climb up and mount them. Everyone has a different idea about the direction in which they will sit once they reach the top. What Would You Put Here? In most people’s view these two figures are husband and wife, although there are other opinions. Despite the fact that they are made of marble people have attributed feelings to them. Their air of self-worth may be due to the fact that the marble they are made from is expensive and imported. The red mark on his left eye suggests he is actually half blind. However, there are those who believe that it is just the dirt of time and can be washed away with bleach. 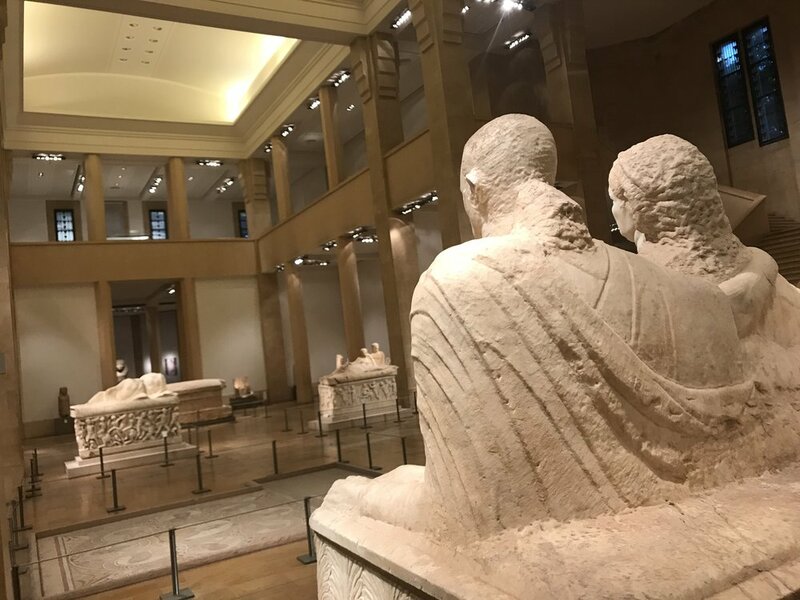 According to the many people who have stood at their feet, they have more authority in this museum than we do “they have more authority than we do….because they have more presence.” They certainly think that they own the place. Perhaps their sense of superiority comes from comparing themselves to the headless couple and the nondescript couple across from them. What Happened To Your Face? On first view these figures seem worn down and undefined. Many possible reasons have been suggested . The figures however remain relaxed and unmoved as though they are sitting in a room watching TV seemingly affectionate and settled in their ways. They don’t seem in any hurry to explain that they are just waiting for an artist to come carve out their features. They have waited for centuries. Recently, a visitor suggested that perhaps they should resort to replacing their unresolved heads with a 3-D print of the heads they were always supposed to have. These figures lost their heads somewhere. When asked whether what they think matters, one visitor to the museum had this to say, “a body without a head has no thought." Do You Follow The Law? This small figure’s look of uninterrupted reverie, his seeming sense of abandon, as well as what appears to be an unbridled appreciation for wine have led some to assume that he does not feel constrained by the law. On close inspection one makes out that he is stretched out on a lion skin, although at first glance this is not immediately apparent. When considering how best to free him from his glass case, one suggestion was to take one of the metal stands on which the museum labels are affixed and to crack the glass so that he can climb down a move freely through Beirut. There are differing opinions as to what the reaction would be to this. There are those who believe he would not know much about the world he would be limping into. There are others who are quite certain that he would vote in the next election although they are not all in agreement of who he would vote for. Despite the air of authority and assuredness many have attributed to him, one person indicated that he may in fact be hesitant to leave the confines of the institution, and would in fact prefer to stay in his comfort zone. Some people believe that the key to discerning the gender of this figure is to examine the shape of the left foot and the toes that are exposed beneath the drapes of the marble robe. Many people have deliberated as to whether there is another half to this figure and if in fact there is, where it might be. These figures, two of many dancers and singers carved in stone on this sarcophagus, have traversed numerous musical eras together. The standing figure appears to be swaying to a song although it is hard to know what she is thinking since she has lost her face. The seated figure seems vaguely present although he is but a trace of himself. Wherever his body may be, many people have felt that there’s a song that can reach him beyond his detachment. While it’s unlikely that he will ever find his way back to the edge of this sarcophagus, to her he will always remain a figure that was once there. This seated woman is silent. She has a hole in her head and one of her hands is gone. She has been around for a long time and has seen everything despite the fact that one of her eyes is missing. She is different from everyone else here. As people pass her, questions arise that her stone lips do not answer. She does, however, have the power to project her answers into their heads. The questions are unchanging, but her answers are never exactly the same.